Considered one of the most important insecticides used in the agricultural sector to ward off unwanted insects and improve the quality and quantity of crops produced, insecticides have always been an essential entity for the agriculture industry. 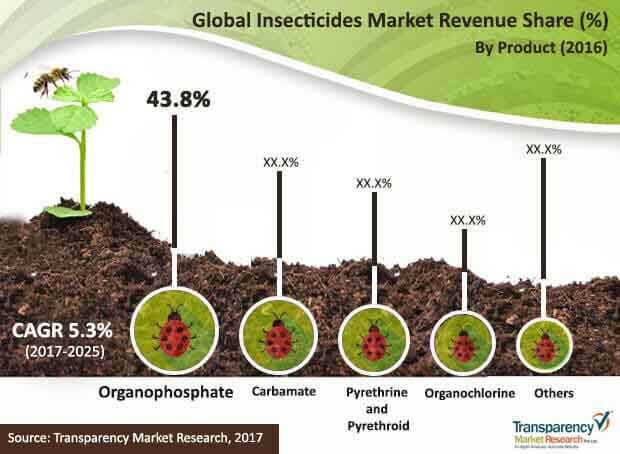 The market for insecticides continues to display strong growth prospects as crop losses from insects become more evident and demand for agricultural produce continues to rise from a rising global population. Increased focus of governments on improvement of the agriculture sector is leading to more funds diverted towards R&D activities aimed at the development of more effective products and reforms reach out to a larger population of farmers in emerging economies. R&D activities have also increased with a focus on the development of more bio-based and cleaner products as consumers demand natural and cleaner food products. The increasing instances of insect resistance to popular synthetic insecticides are also driving developments in the global insecticides market. According to the TMR report on the global insecticides market, the market is likely to register a 5.3% CAGR from 2017b to 2025. Considering that the numbers hold true, the market is likely to rise to an opportunity of US$23 mn by 2025 from US$14.6 mn in 2016. Of the key varieties of insecticides in the market, including organophosphate, pyrethrine and pyrethroid, carbamate, and organochlorine, the segment of organophosphates raked in the largest share of 44% in the overall market in 2016. The segment, however, is likely to see a decline in its valuation by the end of the forecast period owing to several bans on this class of insecticides considering the negative health impact of these chemicals on consumers and people who are in close contact with them – mostly farmworkers. The segment of carbamates, on the other hand, is likely to surge at the highest CAGR of 5.7% from 2017 to 2025 in terms of value. The fast action of this class of insecticides is likely to work in their favour. Pyrethrines and pyrethroids, the less toxic new generation insecticides are expected to witness lucrative growth opportunities over the report’s forecast period. These insecticides are likely to benefit from their rising demand in Middle East and Africa. Increased consumer awareness regarding the negative impacts of a variety of insecticides on the health of humans, animals, and the environment are likely to bring increased focus on bio-based products such as neem oil and insect growth regulating enzymes and hormones. From a geographical standpoint, the market in Asia Pacific is likely to account for the dominant share of the overall market in terms of volume as well as revenue over the forecast period. The reasons contributing to the strong position of the regional market include the high plant diversity and a vast set of different climatic conditions across regions and countries in the region. The presence of several agrarian economies, tropical climate, and the vast area of arable land in several countries in the region also present vast demand before the insecticides market. The region presents promising demand for insecticide classes such as carbamates and organophosphates. On the other hand, the demand for pyrethroids and pyrethrines is low owing to their high costs. The market in Latin America is likely to offer promising growth opportunities owing to increased focus of governments on improving the agriculture sector through funds and reforms. Europe and North America are likely to remain strong markets owing to steady improvements in the agriculture sector and the rising demand for improvement in crop production owing to rising populations. Some of the leading companies operating in the global insecticides market are DowDuPont Inc., Bayer AG, FMC Corporation, BASF SE, Nufarm Ltd, Syngenta International AG, Monsanto Company, and PI Industries. Insecticides are primarily employed in agriculture industry. Asia Pacific accounted for the major share of the global insecticides market, in terms of both revenue and volume, in 2016. Insecticides such as organophosphates, carbamates, pyrethrines & pyrethroids are used to combat insects damaging fruits & vegetables, cereals & grains, and oilseeds & pulses. Organophosphates are estimated to offer lucrative opportunities in the insecticides market in the near future. Fruits & vegetables are anticipated to account for higher market share during the forecast region. This study analyzes, estimates, and forecasts the global insecticides market in terms of volume (m3) and revenue (US$ Mn) from 2016 to 2025. The report also analyzes several driving and restraining factors and their impact on the market during the forecast period. The report provides a detailed view of the insecticides market based on products, and crops. Key products included in the report are organochlorides, organophosphates, pyrethrines & pyrethroids, and others. Key crops included in the report are oilseeds & pulses, cereals & grains, fruits & vegetables, and others. Furthermore, the report segments the market based on key geographies such as North America (the U.S., Canada), Europe (France, Germany, Italy, U.K, Spain, Rest of Europe), Asia Pacific (China, India, Japan, ASEAN, Rest of Asia Pacific), Latin America (Brazil, Mexico, Rest of Latin America), and Middle East and Africa (GCC, South Africa, Rest of Middle East & Africa). The insecticides market is further analyzed into major countries of each region. It also provides market volume and revenue for each product, and crop at country level. Based on products, crops, and countries, the report analyzes the attractiveness of each segment with the help of an attractiveness tool. The study includes value chain analysis, which provides a better understanding of key players in the supply chain (from raw material manufacturers to end-users). Additionally, the study analyzes market competition and industry players using Porter’s five forces analysis. The report includes an overview of the market share of key companies in the global Insecticides market. Some of the key players in the Insecticides market include Bayer AG, BASF SE, DowDuPont Inc., Monsanto Company, Syngenta International AG, FMC Corporation, Nufarm Ltd, and PI Industries. Secondary research sources that are typically referred to include company websites, annual reports, financial reports, broker reports, investor presentations, and SEC filings, internal and external proprietary databases, and relevant patent and regulatory databases. Other sources include national government documents, statistical databases, and market reports, news articles, and press releases and webcasts specific to the companies operating in the market. Secondary sources referred for the study of the Insecticides market include United States Environmental Protection Agency, National Pesticide Information Center, Crop Protection Monthly magazine, company presentations, etc.